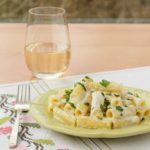 A recipe for rigatoni pasta with a creamy goat cheese alfredo sauce. It can be served as a side dish or topped with chicken or shrimp for a main dish. In a large saucepan, melt the butter over medium heat. Add the garlic and cook until fragrant, about 1 minute. Slowly add the half-and-half while whisking or stirring constantly. Add the goat cheese in small amounts and whisk or stir until cheese has melted and mixture is creamy and smooth. Add the cooked rigatoni and stir to coat the pasta with the sauce. Reduce heat to low and simmer for five minutes. Season with salt and pepper to taste. Remove from the heat and allow to set for a few minutes for the sauce to thicken. Serve immediately. Garnish with chopped fresh parsley or toasted pine nuts if desired. Optional: Serve with grilled chicken or shrimp on top.